Traveling Tech Guy Blog: Go Bears! My office has a nice tradition: every Friday, in season, 2 football tickets, to either the SF 49ers, or Cal Bears, are raffled out. I've tried twice and didn't get them. This Friday, I was off work, but had to go through the office to submit an expense report. On a whim, I threw my name in the box. 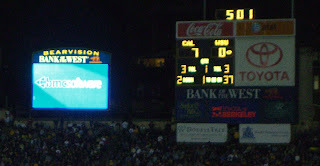 And 2 hours later got the email informing me I got 2 tickets to see the Cal Bears take on WSU. 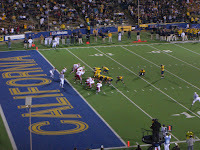 My company is one of the Bears sponsors, so I got good seats and a free parking pass close to the stadium in Berkeley. I've never been to a college football game before, but I've enjoyed every minute of it. seems a bit empty out there. close to the stadium? My legs disagree.Yet , for some reason , distances in america becomes shorter then other countries. Probably einstein could shed some light on this. I join Guy's between the line message: If you haven't been to a football game before , go for the experience.